When the clock approaches 5:00 p.m., do you start worrying about what to have for dinner? Are you always scrambling for an answer? If so, try this old-school trick that's back in fashion — meal planning. Meal planning is a great way to make sure you're providing your family members with a variety of healthy foods that meet their nutritional needs. And, as every frugal cook knows, meal planning can also save both time and money. 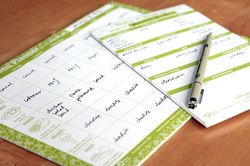 How does meal planning save time and money? Just consider how much time you spend standing in front of your refrigerator looking for something for dinner. Add to that the time spent running to the grocery store to pick up this or that needed ingredient. How often do those unplanned trips result in impulse purchases? Or maybe you often end up eating out, which takes a big bite out of your budget. In addition, if you eat out a lot — especially at fast-food joints — you're probably not eating as healthfully as you should. Finally, think about the food that goes to waste because you bought it without a plan for how to use it. By investing a little time upfront, you can avoid these time- and money-wasting pitfalls — and avoid dinnertime panic. With meal planning you know what to buy, which makes your grocery shopping more efficient and reduces the need for unplanned trips to buy one or two items. And with a grocery list in hand — a byproduct of good meal planning — it's easier to resist overspending on food you won't use or don't need. Meal planning doesn't have to be complicated. To get started, jot down some of your family's favorite meals. Better yet, get your family members involved by asking them to suggest menu ideas. Flip through cookbooks or look online for recipe ideas. Check the weekly food ads for sales. Think seasonal. What fresh produce is available this time of year? Is it salad season or soup weather? Consider what's on sale and on hand. What's on sale this week at the supermarket? What's in your pantry? Mix things up. Keep the menu interesting by planning some meatless meals or substituting breakfast for dinner. Alternate new recipes and old favorites. Picture the plate. Here's a trick for making sure your meals include appropriate portions of key food groups: As you plan a meal, keep in mind that fruits or vegetables should cover half your dinner plate, and lean protein and whole grains should each take a quarter of the plate. Give each day a theme. Don't start from scratch every week. Establish theme days. For example, designate Mondays as pasta nights and Thursdays as chicken nights. Or plan to try new recipes on Saturdays and polish off leftovers on Sundays. Recycle your menus. Don't throw away your menu plan at the end of the week. Instead, hold on to it and reuse it in a couple of weeks. Your family shouldn't mind eating the same meal twice in one month. Build in flexibility. Your menu isn't written in stone. Feel free to swap things around. Or designate one night as "cook's choice" and use that night to clear out the refrigerator by making a casserole, stir-fry or other mix-and-match meal. Take it further. Try planning two weeks or even a month at a time. See if you can grocery shop every other week instead of every week. Take a moment to feel good knowing that your meal planning makes it easier for you to offer your family a healthy variety of foods each week. And give yourself an extra pat on the back for saving time and money while you're at it!